Whenever The Wife and I make a trip to Hong Kong, she always wants to have a Twisty Pasta Breakfast which is only available here. It's our tradition, and this latest trip was no exception. It also happens to be pretty much the only regular menu item that I'll eat even when not writing a review! 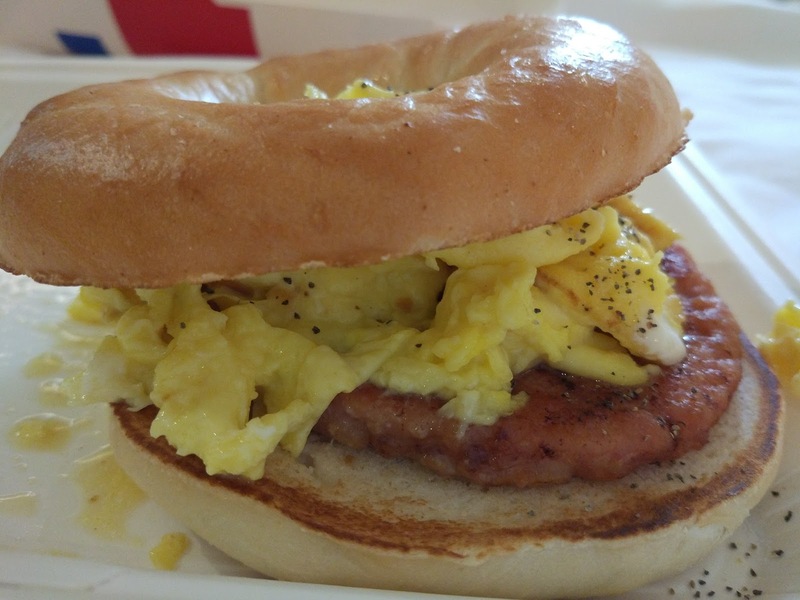 This morning (yes, this is one of those rare reviews that I write on the day I ate the food) I felt like giving the only breakfast promo currently available a try together with our Twisty Pasta Breakfast, the Bagel Deluxe Breakfast. 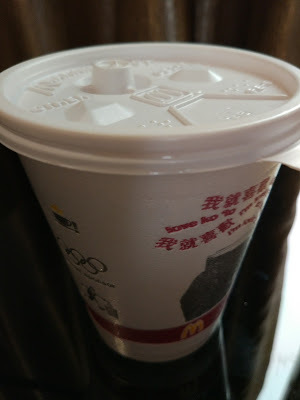 McDonald's Hong Kong also sells a handful of "premium" drinks that you could out swap your regular coffee or juice for a token additional payment of $1HKD ($0.13USD) so I opted to go for the Purple Rice Soy Milk as it's something I've never had before, even outside of a McDonald's. Our hotel was only a block or so away from a McDonald's so rather than eating it in the small and very busy restaurant, we brought it back to our room. 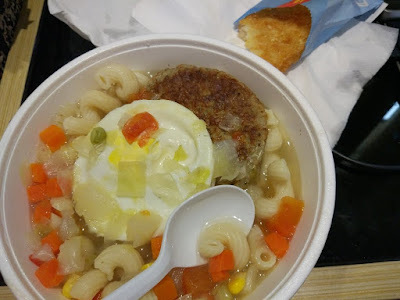 When I cracked open the box, all the ingredients of my breakfast had shifted to one of the box during the short walk back, and the already meagre looking food within looked even worse when piled on top of each other. Since the only thing truly "special" in this meal was the bagel, I was at least expecting a bagel of half-decent quality, but even my photos show how miserable it looked. 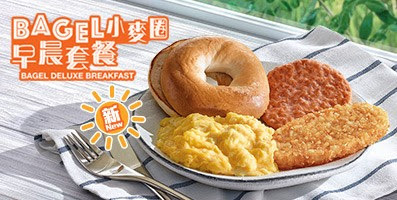 The bagels in the promotional material McDonald's HK used, looked large and like a bagels should, but what was served was completely different. The hole in the centre was far too big, and the bagel itself wasn't large, nor fluffy - it looked more like a dough ring rather than a bagel. Since it was served in the Big Breakfast/Hotcakes box, I guess it was intended to be eaten with a knife and fork. 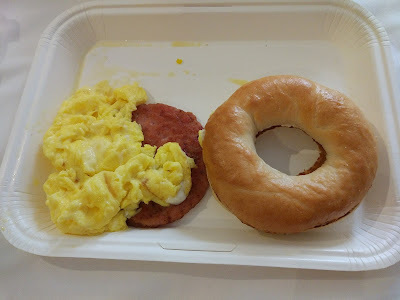 Sure, that could be possible for the eggs and sausage, but then what I was I then supposed to do with the bagel? 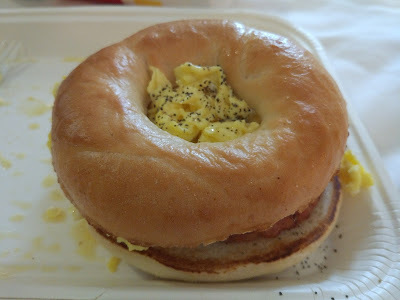 It was toasted (but served cold), but I wasn't provided with with butter, nor margarine, to spread on the bagel. 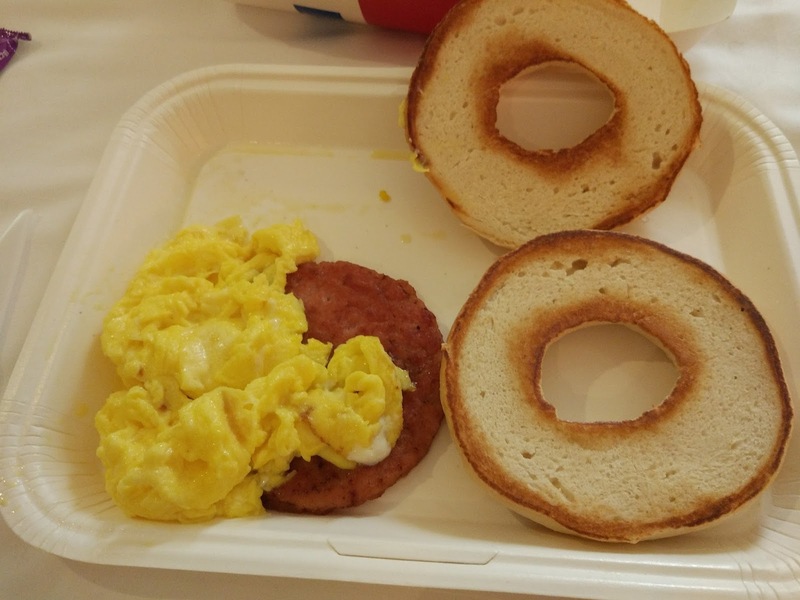 It was however served with a packet of Grape Jam (see top photo)...I've never put jam on a bagel before and wasn't about to start today, and since it was a pretty pathetic looking bagel to begin with, I wasn't going to eat it dry. So I ended up turning the entire meal into a bagel sandwich...Which coincidentally is available in Canada. To be completely honest, the Bagel Sandwich I concocted wasn't half bad, and could be a promo item of it's own, it was probably better than the actual NY Bagel Burger that I had in Taiwan last year. I was almost about to be a bit cheeky and thought I could then spread the Grape Jam all over my sandwich, but I opted against it as I was actually pretty hungry and wanted to enjoy as much of the meal as I could. 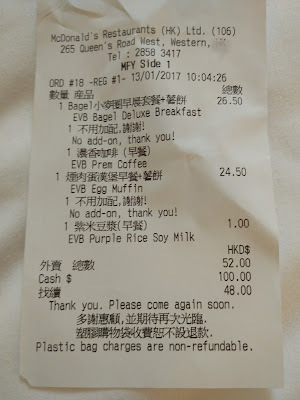 The Purple Rice Soy Milk was a bit boring, so that's why I am not dedicating a review of its own for it. 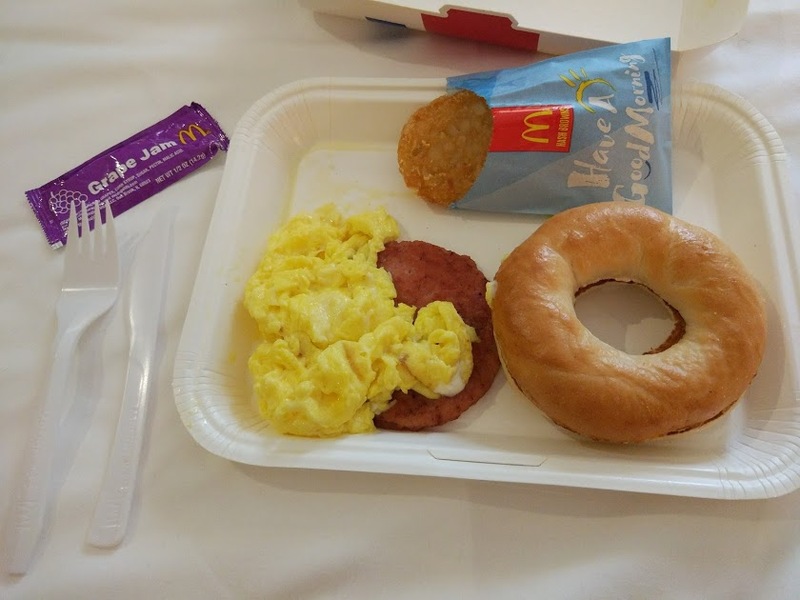 Plain Soy Milk has been on the McDonald's Hong Kong breakfast menu for a few years now, and I vaguely remember the 'Purple Rice' variant popping up up 1-2 years ago during one of their "healthy" promotions, so I guess it's become a regular menu option as of late. Soy Milk for breakfast is extremely common in Hong Kong is typically served hot, but you can also get it over ice (and sweetened) pretty much any time of the day. Sweetened Soy Milk also comes in various varieties and flavours, like Melon, Chocolate and Strawberry, and I've had those before (they are even sold at convenience stores next to the Coke and Water) but I've never had any being Purple Rice flavour before. 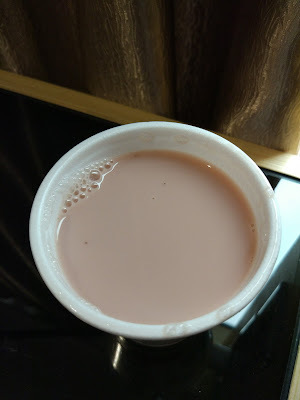 This Purple Rice Soy Milk was served in the typical styrofoam cup (used for tea) but mine wasn't really all that hot, which was a bit disappointing, it also wasn't all that purple. 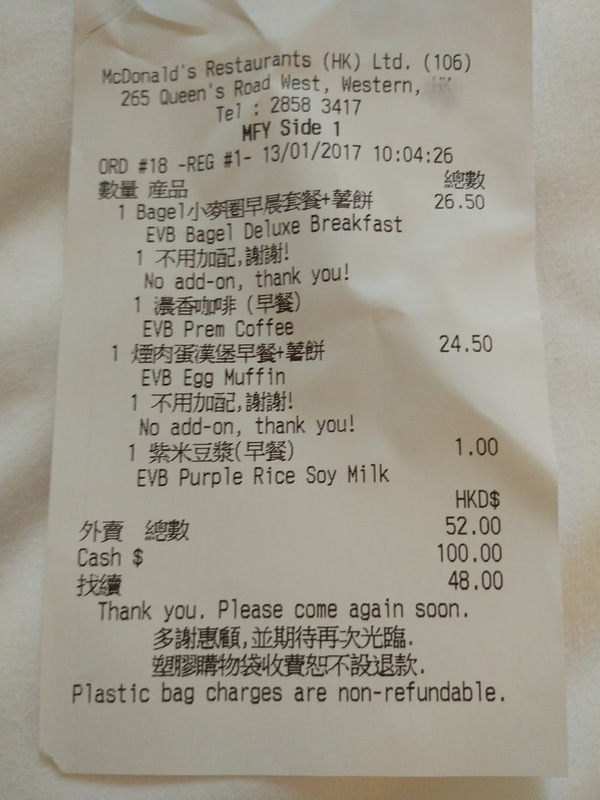 Plain Soy Milk is off-white, and I guess this was off-purple? Either way it still wasn't anything close to the purple shown in the promo photos. 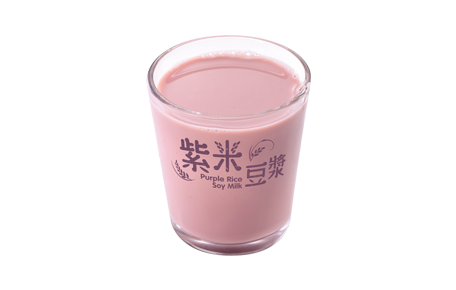 As for the taste, it was no different from standard Soy Milk. I didn't taste anything special and had it not been that slight shade of off-purple I wouldn't have noticed any difference between it and plain soy milk and since I'm not the biggest fan of soy milk in general, I only had a couple sips before returning to my coffee. Here's The Wife's Twisty Pasta meal. 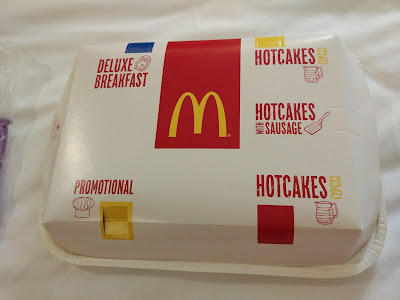 I think I'd prefer hotcakes! I love jelly on my egg sandwiches! The contrast of sweet to salty (from the meat) is really nice.